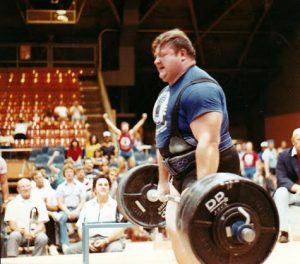 As old school as you get, Paul Wrenn, one of the most underrated lifters the sport of powerlifting has ever had. 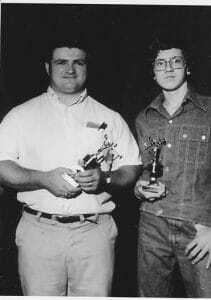 This photo is from the early 1980s when Paul mentored many adolescent lifters in Tennessee. 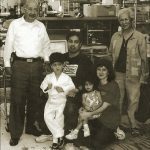 Like most lifters of his era, Paul did not “cycle” as per the modern term but instead, had certain times of the year he cut back in order to put more emphasis on family and preaching. My oft-repeated story of my father’s admonition to “get another job” if I was so willing to devote time, energy, and what was to him, back-breaking focus to elevating another five pounds on the bar and “make all of this count for something worthwhile,” was certainly typical of the time. What was also typical was a defacto separation of distinct “seasons” for all of the lifting activities. Including powerlifting once Odd Lift Contests morphed into our official sport in 1964, there was what might now appear to be an unusual approach to even the most serious level of training. Once the heat of summer arrived, even the top-level men in all of the iron sports either reduced their training by a significant level, or took off completely for one to two months. The summer was seen as a time to enjoy other outdoor activities as the weather allowed and even the highly ranked York Barbell lifters for example, would inject softball, baseball, hiking, swimming, and running-game type activities into their training schedules, often in place of actual barbell training. Bodybuilders would take off days of training, doing enough to maintain the physiques they had worked so hard to develop during the colder months so that they could spend time at the beaches or lakefronts finally displaying the results of their efforts. With the introduction of hot weather and high humidity, the powerlifters too would either cut back on heavy weights choosing to train “lighter” with more repetitions per set, or instead spend two months doing some bodybuilding type exercises to augment the lifting basics like squats, cleans, and bench presses. In many cases, the competitive lifters too would just not lift weights for four to eight weeks, instead putting the time into leisure activities that might require physical expenditure. If one wants to view this approach as an early form of “cycling one’s training” a case can possibly be made for this but recalling many conversations I had with the “lifting guys” in our area, the decision to cease lifting activity for the summer was seen as nothing more than common sense. The Amateur Athletic Union Mr. America Contest and Senior National Olympic Weightlifting Championships might have been held in mid-June with the Junior versions of those contests competed two months prior. However, the Mr. America Contest would attract perhaps twenty-five to thirty competitors, leaving the overwhelming majority of bodybuilders to their own designs during the warmer months. Only the top Olympic lifters qualified for the Senior Nationals which meant that most lifters did not have to begin cranking up their training again until “contest season” began again in late-September. As I recall, most of the Senior National Powerlifting events took place in late June and more typically in July with many meet directors aiming for the July 4th weekend, knowing that families were off from work and could in fact, travel and remain in town for two or three days to either compete or spectate. 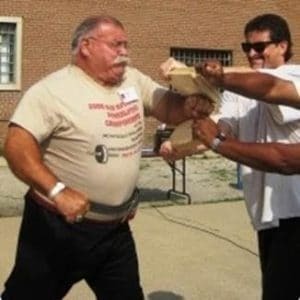 The stifling heat of the Wisconsin summer which led to the infamous “Meltdown In Madison” or the Seniors in Bay St. Louis, Mississippi are legendary in the memories of those lifters who experienced these contests in the late 1970s. Most lifters were more than happy to lighten the weights, increase the reps, introduce exercises they normally didn’t do during the other segments of their training regimens, and enjoy their lifting rather than fight at the highest levels of intensity while barely surviving the heat and humidity after a day of harsh physical work. I know that I was one of the many who enjoyed Bill Starr’s articles in Strength And Health Magazine showing the sprinting and long jump contests the York lifters would partake in after their regular lifting sessions. This was part of their summer time enjoyment and an opportunity to utilize the strength and power they had developed over the preceding months. The summer was a time for high rep squats, timed squats, power rows, and high jumping, a time for experimentation, and until the mid-to-late Sixties, often a time to not train at all! In my many writings over the years, I have been clear that I am not a fan of “cycling” one’s training. It never made sense to purposely hold oneself back and plan on using weights that were significantly lighter than what could be productively utilized in a specific workout. The “cutting back for a while” approach that marked hot weather training served to provide a common sense respite from the constant or year-long pounding of heavy training, but it was not a planned workout-to-workout “cease fire” but rather, a block of time looked forward to in order to rest the body for a relatively prolonged period and try new things. In the mid-1960s things seemed to change as the interest in fitness and lifting trickled down to the general public as well as institutionalized athletics. It became acceptable for athletes to train with weights, with coaches moving from “Don’t do it, you’ll get muscle bound” to a mandatory part of one’s pre-season preparation. Credit Arthur Jones and the 1970 introduction of his Nautilus machines for making it both possible and acceptable for large segments of the non-athletic population to do resistance training. The overwhelming majority of trainees may not have understood his principles nor followed his dictum to “train as intensely as possible” but the convenience of having machines to train with changed and in fact created, a brand new gym and fitness industry. Year-round training became the norm for competitive and non-competitive lifters and of course, the expectation of air conditioning in almost every gym made summer time or warm weather training tolerable or comfortable. While there is still a lifting season or a period of time where there may be more contests planned by a specific organization, there are so many organizations in the powerlifting “market” that one can find a contest to attend almost fifty-two weeks per year. Thus “Seasonal Training,” a time-honored approach to the sport of lifting heavy weights, became one more concept to drop from the consciousness of the modern lifter.